I ordered a the Adafruit Data Logger Shield as a kit: to solder such a kit is fun :-), and gives me the freedom what to put on the board. The schematics of the shield can be found here. The board features an SD card with level shifter (required to work with 3.3V and 5V devices), two LED’s, a reset button, an I2C battery buffered realtime clock plus a prototype area. 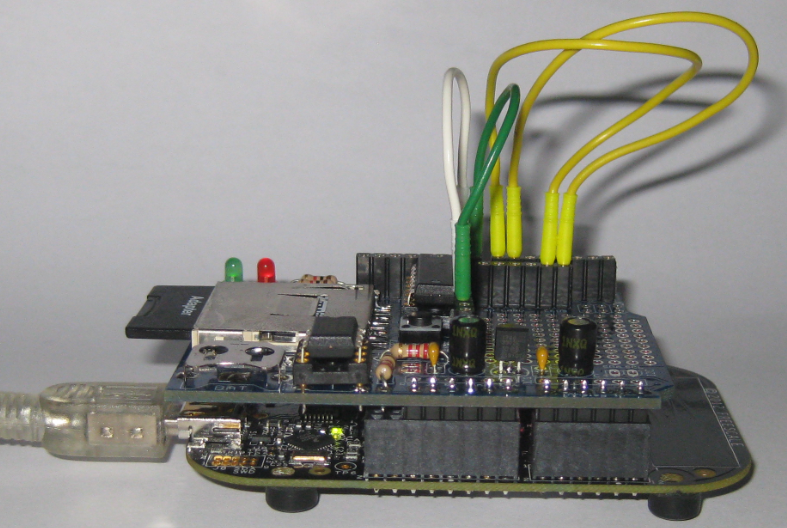 The minimal SD card pins (MISO, MOSI, DeviceSelect, BusCock) and I2C (SDA, SCL) bus are connected to the shield connector rows, while the two LEDs and the card write protect and card detect pins can be routed to any pins with a wire or any other kind of connection. In above picture the green wire is for WP (SD card Write Protection pin), the white wire is for the CD (SD Card Detect) pin. The yellow wires are for the red and green LED. The application is Eclipse based CodeWarrior for MCU10.3 application. It uses the SD card with the open source FatFS file system. ❗ The FAT_FileSystem and SD_Card component have been updated to work with Kinetis. So make sure you use the latest component from EmbeddedComponents for this project. 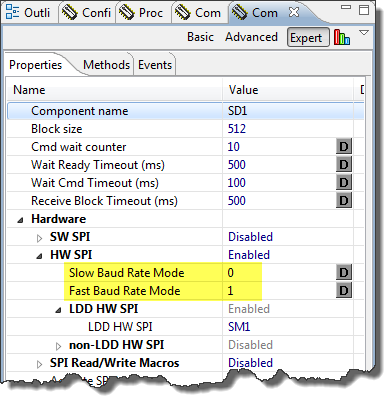 Wait: generic busy wait routines, needed by the SD card driver because initialization of the SD card driver needs to wait for a time as specified in the SD card standard. 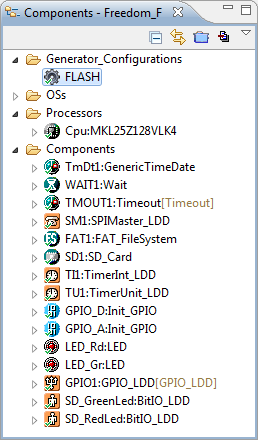 Timeout: As SD card operations can take a very long time (several hundreds of milliseconds), this timeout driver allows to wait for a given time. SPIMaster_LDD: implements the SPI bus driver using interrupts. FAT_FileSystem: Implements the FAT file system. 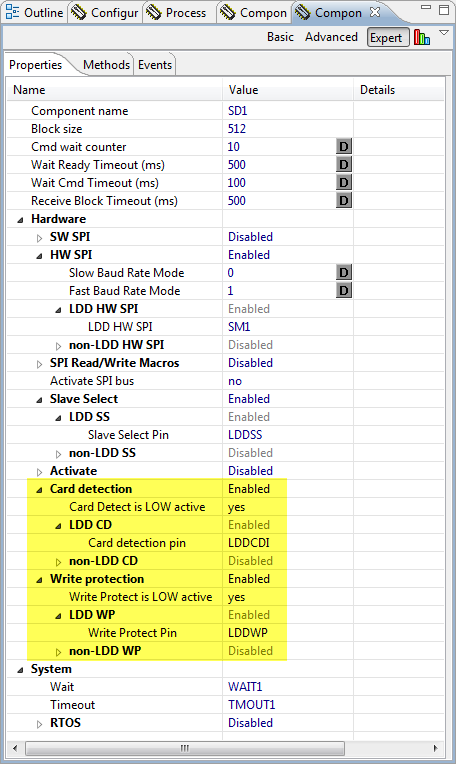 SD_Card: Low level SD card driver implementing the memory device. 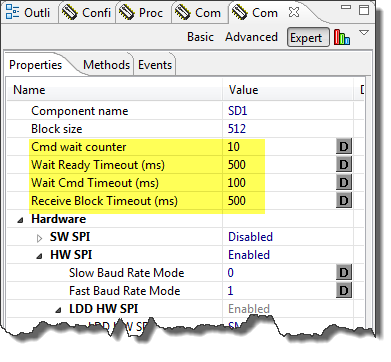 TimerInt_LDD and TimerUnit_LDD: implement a 10 ms timer used for the Timeout component. Init_GPIO: Init components used for pull up resistors for the WP and CD signals (see this tutorial). LED and GPIO_LDD: Driver for the RGB LED on the Freedom board (see this tutorial). 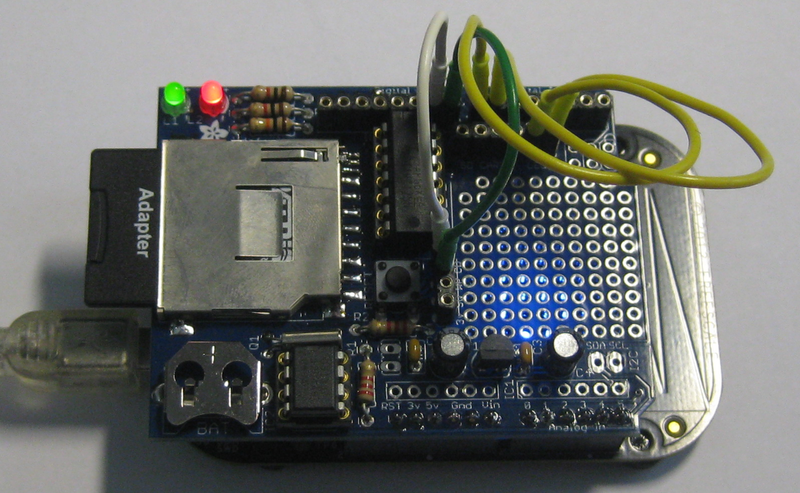 Note that the signal for the blue RGB LED is used for the SD card SPI clock signal by the Data Logger Shield. BitIO_LDD: Used for the green and red LED on the shield (see this tutorial). 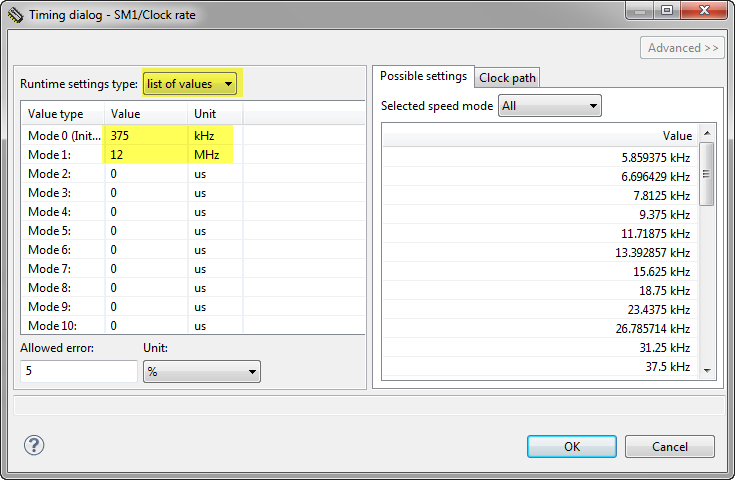 The Attribute Set 0 needs to point to Clock rate index 0, and the so the Attribute Set 1 to Clock rate index 1. The reason is that we need to SPI clock speeds: a maximum of 400 kHz for card initialization and up to 20 MHz for normal operation. What we can achieve here is 375 kHz and 12 MHz. As the SD card requires up to several hundreds of milliseconds delay, the Timeout component is used. If the signals do not have pull-ups or pull-down resistors on the board (as for my shield), they need to be configured in ‘pin-sharing’ mode and with pull-ups enabled (see this tutorial). The WP signal is connected to the shield D8 line, and the CD signal is connected to D9. The projects used the RGB LED on the Freedom board plus the two LED’s on the Shield. The two shield LED’s are connected to the shield D7 and D6 lines. If a card is inserted, the Red RGB LED will be on and the file system will be mounted. If the card has not the write protection tab on, it will write a file ‘test.txt’ with an example text in it. For now I only have this shield, and it worked very well with the Freedom board. The shield has an I2C Real-Time-Clock on it for which I did not wrote a driver yet. That would give me a battery backed up clock which would make it ideal for a data logger application. Again, still some work to do :-). I need to check/measure the SD card speed, but for now it is reasonable for my tests. For sure I will need to extend my Shell Project with the SD card capabilities. The project and sources is available from this link. Code size with gcc and even not optimized at all is less than 18 KByte, so very reasonable. This entry was posted in Boards, Embedded, Embedded Components, FatFs, I2C, Kinetis, KL25Z Freedom Board, Processor Expert and tagged CodeWarrior, Embedded Component, FatFs, I2C, KL25Z Freedom Board, Processor Expert by Erich Styger. Bookmark the permalink. I have found out that if I make SD1_SPI_WRITE_READ_BLOCK_ENABLED 0, thus disabling block write-read, then it works perfectly. Thanks for posting what works for you. There is a setting ‘SPI Block Transfer’ in the SD_Card component which controls this. In order to have it working with block read/write, interrupts with buffers in the SPI component need to be enabled (SynchroMaster component, Interrupt service/event enabled with input and output buffer size of 512. My SynchroMaster component SM1 has its input and output interrupts enabled and supports a hardware input/output buffer of size 1 only. My SD_Card component has its “SPI Block Transfer” setting on “yes” and has a “Block size” property with a value of “512”. I think “supports a hardware input/output buffer of size 1 only” is your problem. Yes, the hardware has only one byte, but the thing is that the AsynchroSerial component uses a ring buffer so supports much more. Try to set it to say 512 bytes. Otherwise see my examples on GitHub which are using a larger buffer size too. I have checked your project on GitHub and found out that I have the same “Hardware Input/Output Buffer Size” properties. What I’ve found out to be is these two screenshots. Basically, if the interrupt routine is exited by a “Step Over(F6)” debug command and then re-entered, the status register is 224 (DEC) and works fine. However, if the interrupt routine is exited when the debugger is in “Run Mode” that is, for example, pressing “Run To Line (Ctrl + R)” in the first line of the interrupt routine, status register is 96. Sorry, the status register is *sometimes* 96. And this leads to a mismatch between “InpRecvDataNum” and “OutSentDataNum”. I am using MKE02Z64VLD4 with my custom board. I guess at this point it seems like I have to disable the “SPI block transfer” and live with the performance decrease.. I don’t know why, but my code is getting stuck inside the “FAT1_Init();”. There is no error, but when I call this function, it never gets out. I’m using MK20DX256VLL10 processor (I did the necessary changes I guess). where exactly does it get stuck? Are your interrupt turned on? 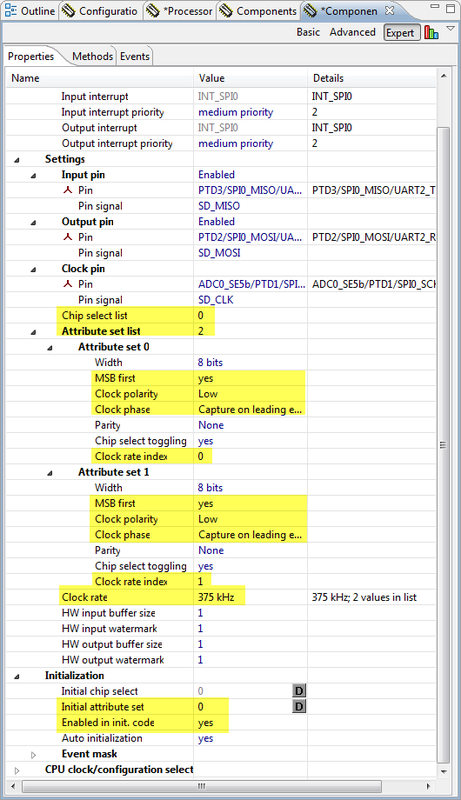 If using interrupts, have you allocated enough buffers for the SPI? It’s working now. My interrupt was on, I turned it off and it works just fine now. Thanks for the reply Erich!